A repeat visit to a special place, and a wine discovery. I have been travelling most of this last week, which is why I haven’t posted a new blog entry (not just because I wanted to leave the DRC entry for ages, honest). But I have been in the beautiful wine area of Minervois in the Languedoc, so I have plenty of material in waiting. 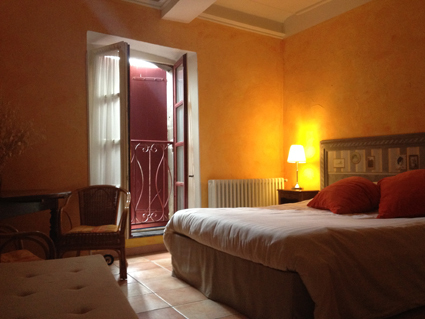 After staying with some great friends, I awarded myself one night at the Hotel d’Alibert in Caunes-Minervois, a beautiful medieval village north of Carcassonne. 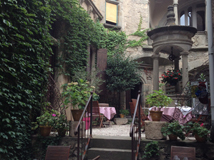 The hotel is 500 years old, and the proprietor is a noted wine-nut called Frédéric who oozes charisma in several languages and with a very dry sense of humour. We also shared the same taste in music I discovered the following day. This place is the must-go venue for wine trade people visiting the area, and it transpired that my friend, the Californian winemaker Randall Grahm, had stayed there before visiting my part of the world, a couple of weeks ago. I’d eaten here many times, but never stayed. Set around a magical courtyard, which becomes the dining room on summer’s evenings, the hotel is an absolute gem of architecture and the internal fittings are all newly done, but in keeping with the building’s character. My room was full of antiques, but simply and comfortably presented in a sunny shade of yellow. Carignan is an under-rated variety I think. The best examples offer an earthy, rich, spiciness with plenty of deep fruit and a coffee/garrigue character. 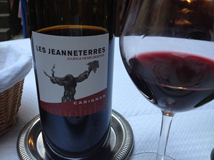 Usually they are best from old vineyards; young Carignan vines seem to produce slightly rustic almost coarse flavours. But not in this case, the wine was silky textured and rounded. Plenty of flavour (and no lightweight in alcohol terms) and a long finish. I shall definitely search out the producer, but sadly there was not time the next day as I was driving home. Next time! My meal (ludicrously well priced at €28 for three courses) was a tarte of Boudin Noir and apple (I love black pudding, but this had the lovely creamy texture and spicy flavour of the best of the French examples), followed by a beautifully cooked Magret de Canard with a selection of vegetables including that wonderful spinach in cream stuff that is indulgent but delicious. All of this went well with the Carignan. 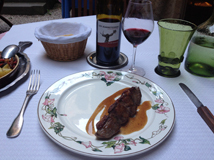 Both eating and staying at Alibert is well recommended if you are ever visiting the area, which in itself is something you must consider!